At least we're not alone. When the stock market dips, we're all in the same boat. 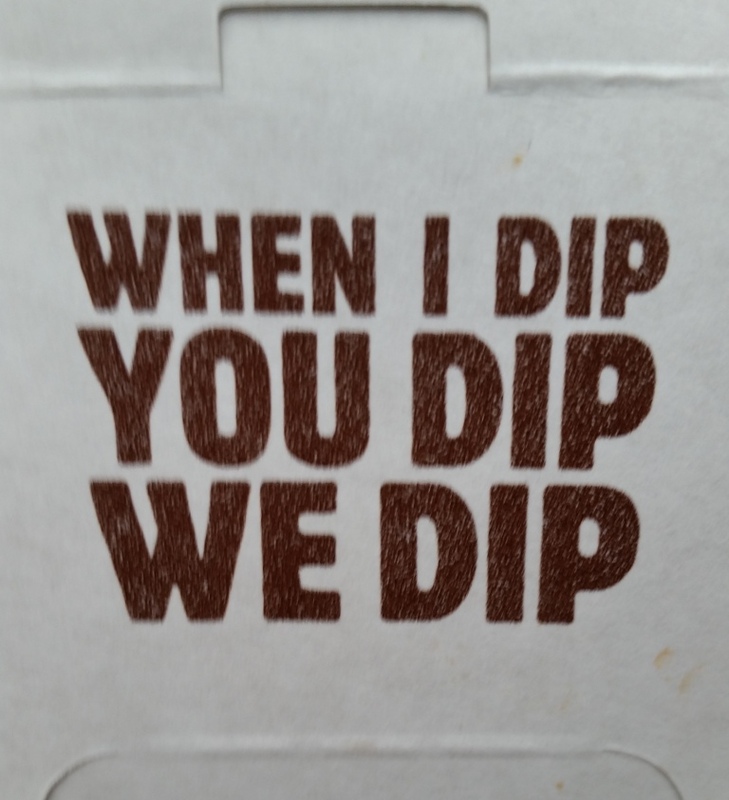 As my box of Burger King chicken fries notes, when I dip, you dip, we dip. I notice my behavior shifts pretty dramatically when markets take a dive. If I see that the market is having a really bad day, instead of just waiting until the beginning of the next week and investing as I normally would, I check to see if I can invest today, you know, since it's such a great opportunity. I'll look for cash we can allocate to investments instead. I'll try to reduce other budget categories, like pesky travel or restaurant line items, to invest more, today. The downside is that, even if markets drop 2% today, there's no indication whatsoever that this is "the bottom", whatever that means. What happens if the dip continues tomorrow? Well, if that happens the process repeats all over again. I look for budget line items to reduce, for spare cash to invest, all in the hopes of getting in on this investing opportunity that's good for one day only. And what if the dive continues? The whole process starts over again, and then we lather, and then we rinse, and we repeat. This behavior seems pretty similar to my purchasing behavior when retail goods are on sale. It's why we have so many jars of Simple Truth organic pasta sauce in the pantry, even though it's pretty mediocre. I cannot resist the siren call of the good deal, which changes my purchasing behavior and I find myself buying a shelf full of bland pasta sauce just because it says "organic" on the label, just as the soft curve of the market trend seduces me, and I feel myself reaching for my wallet to buy more investments than I thought I would. I wonder if I'm alone in this sort of emotional buying behavior, and the rest of the investing community just sticks to their plan, and buys all their investments on payday. Or is this is a common thing among us frugal folks? Instead of being tricked by the typical marketing for new cars and designer clothes, are we instead induced to buy any time the market is on sale? How do you react when the market dips, my friends and loyal readers? Buy more stocks, perhaps at at a broker like Glenmore Investments, trying to get a good deal on investments? Go the other direction and pull your money out of the market, waiting for a better time to invest? Just stick with the plan? Let's hear it in the comments below. Well, after years of investing on my own and pretty much losing my shirt, I finally figured out that I just dodn't have the temperament for dealing with the market. So now I have an investment guy who does it all for me. I know it's not "what frugal folks do" but it works much better for me both financially and emotionally! Hi there, EcoCatLady. I suspect there may be a lot of frugal folks who hand off their investments to someone else. Betterment, Personal Capital, fee only advisors...there seem to be more and more low-cost options out there for people who don't want to get embroiled with the day to day management of investments. It is wonderful weather in AZ. Too bad I am stuck in a windowless office. I wasn't going to check my assets this month but I couldn't resist. Last November they were doing so well. At least my rental house is keeping me from being too depressed by my 401K. I hope it recovers soon. I want to retire. Thanks for commenting, Daizy. Timing really is everything. For people very near retirement, the recent dip is an anathema. For someone firmly in the acquisition stage, it's a great opportunity. And for someone who hasn't started investing yet, anything the market does is kind of immaterial. I'm like you, I try to figure out how much cash we can allocate to our taxable account. I'm early in the acquisition state, so I see it as buying stocks on sale. And I love sales. Woot! If I'm doing the same things as the savvy financial Latina, I know I'm doing something right. Thanks for stopping by. That's an excellent way of seeing things, Laurie. There's an opportunity cost to the sale purchase. Haha that song. 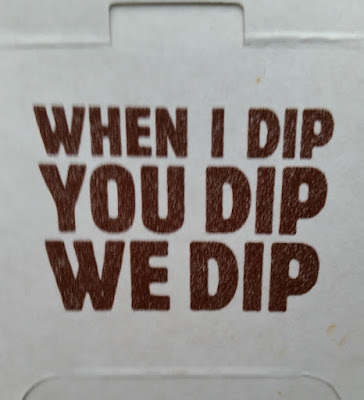 When the market dips, I always waver between "omg what if everything I know about money is wrong" and "ooooh I should invest more while the gettin's good!" Mostly, though, I just try not to pay much attention to it. I think Vanguard once did a study a that showed buying low didn't make much of a difference over time--the most important thing is to invest as soon as possible so you can harness the full power of compound interest. On the other hand, it seems to only make sense that it WOULD make a difference, because when you're buying low, you're buying more of something. So if those shares increase in value over time, the more you have, the better. So I'm kind of torn. But overall, I'm with you--I tend to want to buy when the market dips so I can get a great deal. I can see how trying to time the dips probably doesn't have much of an impact long term, especially since, there must be some times where you'd be wrong. And like you said, just getting the money in play asap is usually the right play if the market's going up and to the right long term. Regardless, it's hard to resist the temptation to buy on sale, regardless of what it is. While we're admitting stuff, I don't even have an automatic investment set up. I just invest big chunks as and when I see fit. Sometimes it's when I think the market is low and sometimes just when I have enough cash to do so. Typically don't have much spare cash around right now but I stuck a chunk into index funds in January when it first dipped. Right, and there's the rub, FIREstarter. Four or five times in the past few weeks, I've seen the nosedive go even lower, and the whole "I need to buy!" impulse cycle starts over. There's really no telling where the valley is, you know? I just stay the course and don't even pay attention much to the stock market. I don't get the urge to sell because I make that mistake back in 2008 and missed on the Bull market run. I do sometimes have the urge to buy more but don't really have much extra money lying around for that. I'm also trying to balance investing in the stock market with investing in real estate. Anyways, interesting that Feb has such great weather for you. We're freezing here in the Northeast! I have a scheduled buy each month, but if the market is looking super low then I might speed up the schedule a bit, like you. I don't think this is a negative, really. It's more of a way to combat looking at the dropping value of the accounts... If I can make it into a sale then I am encouraged to keep buying in as opposed to so many who are looking to sell to protect themselves. I am just getting around to considering managing my own investments, rather than letting them sit in mutual funds, or at least putting my future money into self-managed investments. And I gotta say, I love the whole mentality of stocks being on sale. That being said, a friend of mine has been coaching me to look at it as a game of points, rather than money and now I'm playing with fake money trying my hand at options. It's all very interesting (and inherently emotional - even when I look at it as a game and none of my actual money is currently in play!). I am just closing my eyes and continuing to press the buy button. My wife works to pay the bills, and nearly 100% of my paycheck goes to investing. So, we are just dollar cost averaging and getting a little bit more for our money.